I can only imagine what it would have been like to experience Lost in Space in its initial broadcast run. With the U.S./Soviet space race well underway, but still four years before the United States would land a man on the moon, each week, the space family Robinson were there in the future, on a distant world, with an endless barrage of unknown perils awaiting them. That future would be 1997, when the Earth, no longer able to sustain its overpopulation, would be looking to send families into space to colonize the heavens, and the brave Robinson family—parents John and Maureen and their three children Judy, Penny, and Will, joined by pilot Major Donald West and the ship's robot—would embark on a journey across the galaxy to Alpha Centauri, where civilization could begin again. But even in this future where robots and computers were commonplace, the nations of the world were still divided, and there were some who would plot against the maiden voyage of the Jupiter 2, in the hopes of gaining some advantage or another. Their agent, Dr. Zachary Smith, would attempt to sabotage the mission while the crew were in suspended animation, but by a twist of fate, Dr. Smith is accidentally trapped aboard the spacecraft during liftoff, and he too would become another traveller declared "lost in space." Created for CBS by Irwin Allen, whose Voyage to the Bottom of the Sea had been a smash success, Lost in Space (originally entitled Space Family Robinson) combined the popular space exploration theme with the family adventure/sitcom, debuting on Wednesday nights in 1965. Its unaired pilot would be the most expensive ever produced to date, with the series boasting special effects from Forbidden Planet's L.B. Abbott and Robert Kinoshita. The casting pulled in television veterans June Lockhart (Lassie) and Guy Williams (Zorro), along with child actors Angela Cartwright (Make Room for Daddy and The Sound of Music) and Bill Mumy, who previously had guest spots on Bewitched, The Munsters and several Twilight Zone episodes. Although there were some major format departures with the second season, the series lasted three seasons, but was cancelled prior to a fourth due to budget cuts resulting from the fallout of Fox's feature film fiasco, Cleopatra. Marooned on an alien world filled with unknown dangers, the Robinsons try to survive one adventure after another, with Dr. Smith always ready to undermine their plans. The format is pretty straightforward—after picking up where the previous week's harrowing cliffhanger left off, some new adversity appears, either as a result of one of the crew members doing something they shouldn't, or with the arrival of a strange new alien, which leads to confrontation with the Robinson family. Dr. Smith invariably manages to sweet talk the children into doing his dirty work, which then leads to yet another cliffhanger. The first season, consisting of 29 hour-long episodes and presented here in its original black and white, has its share of memorable installments, perhaps my favorite being The Keeper, Part 2,, featuring Dr. Smith being castigated by a visiting alien, which by this point in the series is well beyond appropriate. Wish Upon a Star sees Dr. Smith in control of a wish-granting machine to humorous effect, while he gets the royal treatment in His Majesty Smith, without realizing his destiny. Forbidden Planet's Robby the Robot makes an appearance in War of the Robots, dueling it out with the ship's resident robot. The Robinson family is a fairly bland mix of personalities by today's standards. John, a professor and the leader of the expedition, is more likely to be the cause of trouble than the one to rectify it, especially when ignoring his kids' warnings about something menacing. Maureen is a typical '50s TV mom, smarter than she lets on to dad, but quite clearly second in charge. Eldest daughter Judy takes a background role most of the time, really only becoming central to a couple of episodes (such as Attack of the Monster Plants), but also takes the part of Don's would-be girlfriend. What really dates this show is the kids, who, unlike modern kids who wouldn't be left to their own devices, are allowed free reign on a strange planet, despite the ever-present dangers, and, with their natural curiosity, manage to discover most of them. Major West is a hothead who ranks second to John for getting the team into precarious situations through his own stubbornness. Then there is the high-tech robot, who befriends Will despite being under the command of Dr. Smith, and who could forget the chimp in a diaper, who we all believe to be an alien. Right? Every show needs a bad guy, and in this series that means Dr. Smith, easily the character who suffers from the most schizophrenic writing. On one hand, he is intelligent enough to be in charge of the ship's most vital environmental control system, and is able to reprogram the ship's robot with no problem, yet he is completely ignorant of even the simplest scientific principles, inept at repairing items he has disassembled, and far more likely than not to press the wrong button resulting in catastrophic results. Over the course of the season, he changes from being just a sinister villian, willing to sacrifice the entire Robinson family for his nefarious schemes, into a lazy, bumbleheaded coward, who thinks nothing of sending children into harm's way to protect himself. Easily despised yet laughable, Smith is both the best and worst thing about the show, but it is hard to imagine the series without Jonathan Harris, as was originally planned. Lost in Space is not the kind of show one should expect to take seriously. While many may cringe at the storylines, characters (Dr. Smith can get pretty grating), and especially the low buck aliens the Robinsons encounter, there are many levels on which to enjoy this series. For those who grew up with it, there is the nostalghia factor, and the chance to relive the many adventures the family faces. From a historical perspective, it is interesting to see both a 1960s view of the future, and the many imaginitive special effects and scenarios, even if they seem primal by today's standards. Perhaps the most obvious entertainment for those just discovering the show is its sheer cheesiness, whether it be the inconsistent character writing, giant lizards, walking fur rugs, or menacing garbage bags. If you can overlook its shortcomings and enjoy it for what it is, Lost in Space is still a lot of fun. Image Transfer Review: Overall, the image quality is very good, with a few caveats. Tonal representation in the black and white image is generally even, grain isn't over abundant (except in process shots), and there aren't many major defects in the source. These episodes were mastered from the videotape of an older film transfer, which does induce a few unwanted side effects. Several episodes contain a good deal of cross coloration, there is a noticible scan line structure much of the time, and some of the grain looks unnatural. A few episodes are on the dark side, which washes out low level detail, and a few others have edge damage, which will only be noticible on widescreen sets. While not the best these could have looked, they are the best we are likely to see. Audio Transfer Review: For a 1960s TV series, the mono audio is completely serviceable, with no real technical deficiencies. There is some occasional distortion, but hiss and dropouts are nonexistent. Extras Review: While there isn't an over abundance of extras, the two included are both fairly interesting. The first is the unaired pilot episode, No Place to Hide,, which provides a very different experience than the final TV show; the major difference is the absence of both Dr. Smith and the robot. The footage from this pilot was recut into several of the TV series episodes, so this feature is best viewed afterwards to avoid spoilers. The second feature is the original 5m:50s CBS network pitch to potential advertisers, using footage from the pilot to demonstrate the show's appeal to its target audience, the "modern space age family." Each of the eight discs comes housed in its own Thinpak case, with chapter listings listed inside, and episode synopsis and original airdates on the back cover. These are housed in a midweight carboard box. Episodes are amply chapter marked with 12 chapters each. 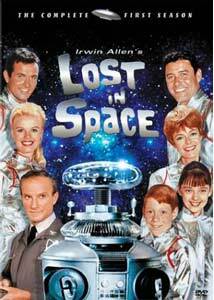 Due to the sheer cheese factor, Lost in Space is an acquired taste, especially if you haven't seen the show before. Fans of the series should be happy with this set, despite it not getting a full remaster before release.